Vibrant pink blooms and elegant vining stems characterize the mandevilla plant. 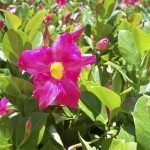 Getting a mandevilla plant to bloom in tropical to sub-tropical regions relies upon plenty of water and adequate sunshine. In cooler climates, the plant is only suitable for summer outdoor growing and may need a bit more babying as the season is short and the vines need to mature before blooming. There are a few tricks you can try if there are no mandevilla flowers on your plant. 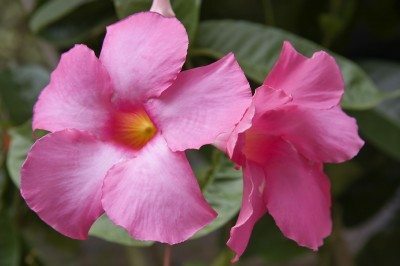 Mandevilla plants need nighttime temperatures of around 60 F. (15 C.) to force blooming. They cannot tolerate cooler temperatures of less than 40 F. (4 C.) and an outright freeze will kill the vine. Northern gardeners who wonder, “Why won’t my mandevilla bloom” may be in for some serious work to encourage this tropical wonder to brighten their landscape. Why Won’t My Mandevilla Bloom? Mandevilla are heavy bloomers in the right conditions. You can even prune them to the ground in late winter or early spring, and the plant will grow back quickly and reward you with the astounding blooms on the new vines. If there are no mandevilla flowers on your plant, the cause could be cultural, improper site conditions or temperatures that are too cool. Established plants that are mature will provide the best color display, so don’t give up on young plants. They may simply need more time to bring out their flower show. These lovely plants need well drained soil with plenty of humus added. Indoor plants thrive in a mixture of peat, potting soil and fine sand. Potted plants should be fertilized every two weeks with a high phosphorus plant food from spring through summer. Feed outdoor plants with a time release bloom food in early spring. 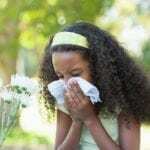 Avoid high nitrogen plant foods, as they fuel leaf and vine growth but do not promote flowers. Provide a support for the vines so the buds can receive plenty of sunlight. Temperatures cannot be too warm, but situate the plants where there is protection from the searing heat during the hottest part of the day. Keep the fast growing vine deeply watered but not soggy. 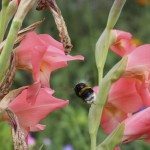 Following these guidelines will generally prevent a mandevilla not flowering. If you followed correct cultural care and siting, there is little reason a mandevilla plant does not bloom. However, in the rare cases where your vine just simply won’t produce, you can force it to flower. Use a teaspoon of Epsom salts dissolved in water once every two weeks for a month. The salt content will build up in the soil if you try this for any longer. The magnesium in the Epsom salts should get it flowering again. In potted plants, leach the soil with plenty of water after trying this treatment. Additionally, a mandevilla plant does not bloom if it hasn’t been trained correctly. 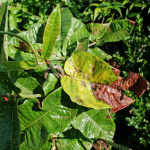 In young plants, pinch off the new growth to promote side shoots. Mandevilla bloom off of new growth so this may be just the trick to get new vines and enhance blooming.